We all love a good crossword. Often, they are best done on a lazy Sunday afternoon with a tall glass of wine and a comfortable chair. However, they can be done anywhere and are a great way to exercise the brain. Of course, we all have that one word each time that leaves us stuck, and a crossword solver is often the perfect solution. It’s not cheating, it’s like having a handy digital dictionary that you can carry in your pocket. In order to help you find the best crossword solver, we have put this guide together, compiling all of the relevant crossword solver reviews in one place, so you can find one that is perfect for you. What is a Crossword Solver? A crossword solver is a handy digital tool that will help you out when you are stuck on a word. It can be carried around in your pocket, which is what makes it brilliant for puzzle solvers who are on the move, and find themselves with a tricky word. They are pretty easy to use, and are often backed by big names like the Oxford and Collins dictionaries, so you know you are getting something official and reliable. You can also flick through things like the abbreviation lists and various synonyms to try and find a whole word that you are having trouble with. The dictionary sizes tend to be quite vast, and some of them will even come with calculators – perfect for those with puzzle books. Now that you have a little more information on crossword solvers and their uses, take a look at the crossword solver reviews below. Seiko is the top brand when it comes to crossword solvers, and with one of these, you are sure to reach success with every puzzle. Have a look at the reviews below and see if this is the crossword solver you need. This model is the perfect size to slip into your pocket, making it easy to transport with you - so you can take it everywhere from the commute to work to an exotic holiday destination. Everything is pre-loaded, so you don’t need an internet connection to work it, and it is very easy to use, allowing you to start solving puzzles immediately. It’s packed full of words, with a high-speed search system that will help you find any one of the 24,000 words that are loaded into it. Plus, with the included thesaurus, you can search over 4 million synonym links and over 300,000 alternative words. It even has an encyclopaedia and spell-checker, so you are prepared for absolutely everything. A couple of customers felt that the previous model was a little better than this one. This cheap crossword solver is ideal for those who don’t have much to spend, or don’t want to pay a hefty price for their crossword solver. While there are some customers who feel that the previous model was a little better, this one still offers a massive range of features that are sure to impress even the biggest crossword fans. A great option that comes at an even better price. Franklin is another good one to look at, especially if you want a crossword solver that has a lower price point. Have a look below and see if this is what you need for your next long commute. 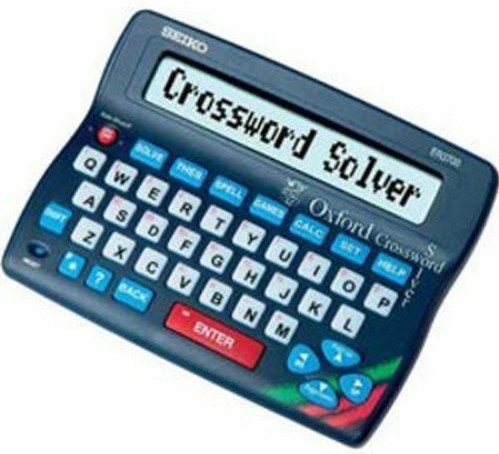 This snazzy little crossword solver comes with a protective lid, so the screen won’t get scratched or damaged while it is safe in your pocket. Everything is pre-loaded as well, so there is no need to connect to the internet or do anything fiddly, which adds to its under friendliness. It’s really easy to get started with it, and the instructions are simple to follow. This is not just a crossword solver, it is also an anagram solver and word builder, helping you to overcome just about any difficult word. 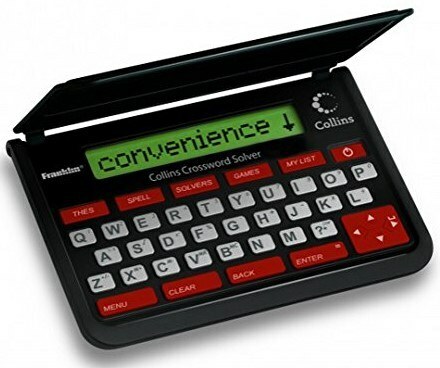 It can work with seven different games, and even has a calculator and currency converter built into it, as well as a metric converter and phonetic spellchecker. With a user wordlist and an extensive dictionary, it has everything included. Some feel that it could have allowed for more characters to be used when searching for a word. 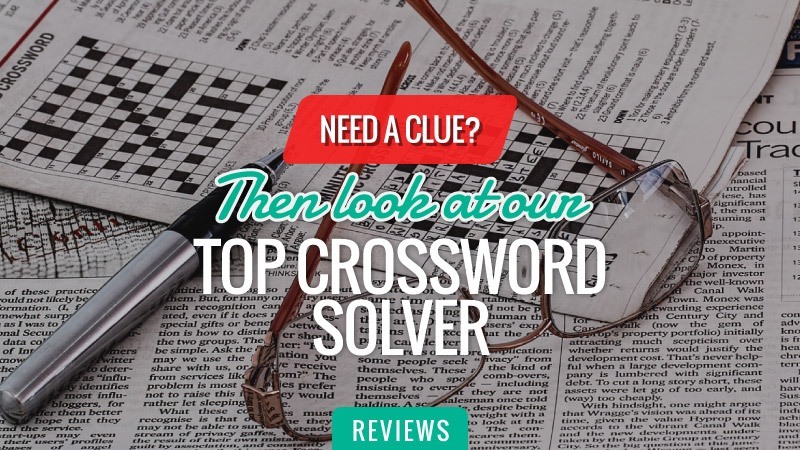 This budget crossword solver is ideal for those who don’t want to spend much or are a little pinched for cash and need something that doesn’t break the bank but still works just as they expected. While some feel that there could have been more characters, this crossword solver is an amazing solution for those who find themselves stuck on the words they need to complete their puzzle. It’s a brilliant option at an even better price. Q: Does this find words without first letter? A: Yes. Use the Solver "Crossword" and for unknown letters including first letter enter Question Mark "?". This usually finds any word providing it is in the dictionary. Collins is a brand you can trust, especially since they provide some of the best and most reliable dictionaries on the market. Have a read of the reviews below and see if this is the crossword solver you will be taking with you everywhere. 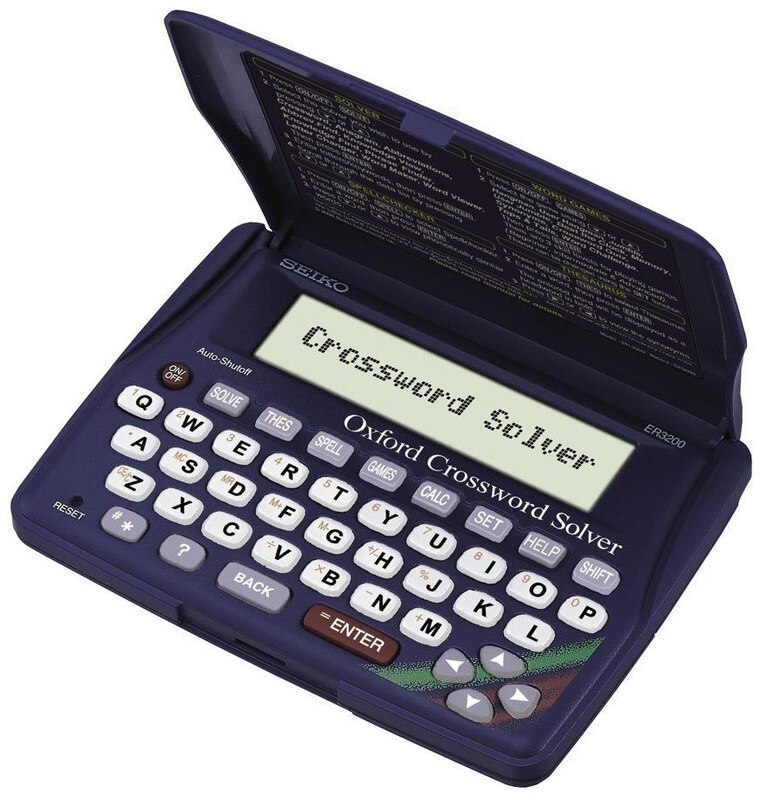 This portable crossword solver will slip straight into your pocket, and even has a lid to prevent it from being scratched or damage while it is in transit. As everything has been loaded onto the device already, you won’t need to connect to the internet either, and the whole thing is incredibly easy to use and set up. 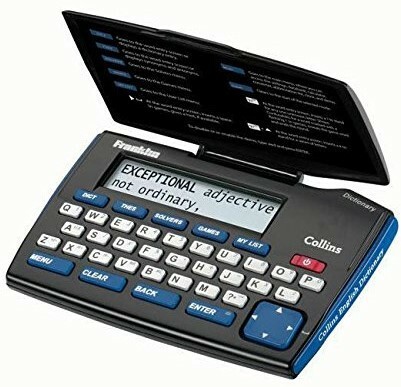 It features the entire Collins dictionary, which consists of 118,000 words and a 500,000-word thesaurus for when you are looking for those elusive synonyms. With a calculator, converter, and even a world clock, it packs a lot into itself while still remaining small and lightweight. It will even check your spelling. It is a little smaller than some customers expected it to be. This model of crossword solver does come at a higher price, but still remains a good and affordable option for any crossword enthusiast. While some feel that it could benefit from being a little larger, it still has a whole host of features that will make solving your crossword puzzles a much easier process. Not to mention that it also includes things like a calculator, converter, and a world clock to keep you updated. It’s definitely a great option to go for. This crossword solver comes at a reasonable price and will help you with all of those tricky words that you can’t quite find. It has a high-speed search system that will look through over 24,000 words to find the one you are in need of. Plus, with the included thesaurus, you can search over 4 million synonym links and over 300,000 alternative words, so you will never find yourself stuck again. 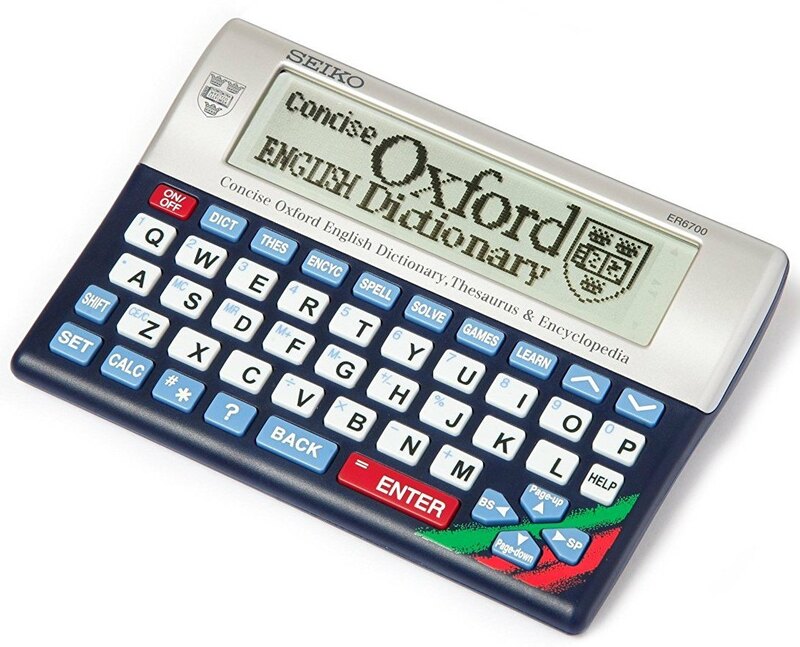 With an included encyclopaedia and spell-checker, it has everything you need. Dictionary, and also has 256 thematic lists that you can scroll through at your leisure. It has a keywords and wildcard finder, and is also able to decode over 10,000 abbreviations with ease. Plus, the Thesaurus contains 2.5 million synonym links. Hopefully, this guide has helped you to find the perfect model for you, and while there are so many to choose from, the best crossword solver is definitely the Seiko ER3700. Available at the great price and with all the features you need, it could be the perfect companion for your lazy Sunday crossword puzzles. Of course, if this one doesn’t quite suit you, there is a whole range listed here - each of which has different features and is available in a good variety of prices. What did you think of our crossword solver guide? Are there any that you would have liked to see or recommended? We love hearing from you, so make sure to leave us a message in the comments below.